Transform the kitchen into a high-efficiency baking center with the Circulon Nonstick Bakeware 2-Piece Bakeware Set. This practical set includes two 10-inch by 15-inch nonstick cookie pans, so it's easier than ever to bake one batch of cranberry-nut chocolate chip cookies, and set up a second for baking. Heavy-duty carbon steel construction provides uniform heat distribution, and rolled edges on the cookie pans offer extra strength with long-lasting warp resistance. The TOTAL' Food Release System on the bakeware interiors combines raised circles and durable, PFOA-free nonstick for a surface that reduces abrasion and is metal utensil safe and easy to clean, with exceptional performance. A Circulon bakeware set is ideal for baking healthy upgrades on such classic treats as almond butter snickerdoodles, as well as roasting farm-fresh asparagus with less olive oil. 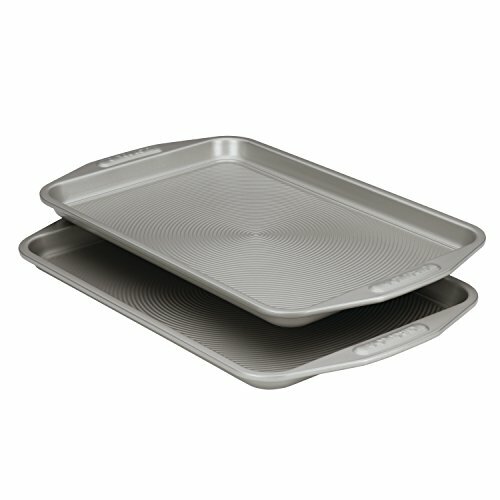 Wide handles on the bakeware provide a confident grip, and the baking pans are oven safe to 450°F. Combine this baking set with other items from the Circulon collection to further enhance your healthy baking solutions. Bake healthy, homemade treats quickly and efficiently with the convenient Circulon Nonstick Bakeware 2-Piece Bakeware Set.